Three Square Code Structures Stonehenge. Life often offers us the polarity of opposites. Something stands in opposition to something else. Abu Mūsā Jābir ibn Hayyān explains how this number square was divided into various corners and gnomons. I show how the dotted points below were the options that were used for the appropriate Egyptian and Palestinian cubits. It was also used for builiding Stonehenge. Multiply the 4 corner numbers: 5 x 7 x 1 x 6 = 210. The Palestinian cubit is 2.107 feet. Multiply the remaining five numbers which are called the gnomon: 8 x 3 x 4 x 9 x 2 = 1728. The larger Egyptian cubit is 1.728 feet. First we must see who gave rise to realizing this division of the square three code in the particular manner that I will present. Abu Mūsā Jābir ibn Hayyān (Arabic: جابر بن حیان‎‎, Persian: جابر بن حیان‎‎‎, often given the nisbahs al-Bariqi, al-Azdi, al-Kufi, al-Tusi or al-Sufi; fl. 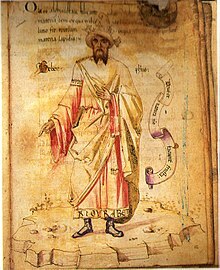 c. 721 – c. 815), also known by the Latinization Geber, was a polymath: a chemist and alchemist, astronomer and astrologer, engineer, geographer, philosopher, physicist, and pharmacist and physician. Born and educated in Tus, he later traveled to Kufa. He has been described as the father of early chemistry. 5 x 6 = 30. This numbers inner stone circles. 7 x 8 = 56. This numbers the outer holes. Plan of the central stone structure. The stones were dressed and fashioned with mortise and tenon joints before 30 were erected as a 108-foot (33 m) diameter circle of standing stones, with a ring of 30 lintel stones resting on top. 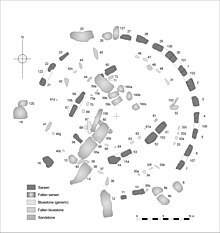 Inner circles had 30 standing megaliths. Outer Circle were dug with 56 pits. Above is a computer rendering. For fun, add 5 + 6 + 7 + 8 = 26. Now, let’s look at the two products and one sum we created from consecutive numbers 5,6,7 and 8: They are 30, 56 and 26. Any beginning student of chemistry knows these numbers define the most stable isotope of iron: (1) 30 neutrons. (2) atomic number 56 (3) Finally 56 – 30 = 26. That is the atomic number of iron. Why is this important? Iron is the ash of nuclear fusion on stars. When enough iron is at the star’s core, it explodes. This creates all the heavier elements than iron. Here’s the big question: Does Stonehenge represent the cosmic stellar process of creation? Was this known in the distant past? Or, is this just another numerical co-incidence? Glendalough Cathedral 30 Miles South of Dublin. St. Peter and St Pauls’ Cathedral Achonry, is a former cathedral in the Republic of Ireland: It is within the same enclosure as Our Lady’s Church and the Round Tower. Glendalough holds a round tower. Its height reveals a prehistoric number code. My source for this measure- 110 feet in height – is the book, Riddles in the British Landscape. It has 148 illustrations and 4 maps. The book is written by Richard Muir, p. 183. Publisher is Thames and Hudson, London, 1981. Where is the height found whose digits are expressed feet by a prehistoric Masonic code? At a slant, 1, 2, 3 gives you the top triangle of the compass. 7, 8, 9 offers the reciprocal bottom triangulated half of the “T” square. Finally, 4, 5, 6, offers the slanted diagonal. Again these numbers are tilted in the number square. In the Masonic symbol above it occupied by “G”. This number square was understood possibly thousands of years ago. It marked a lost & former, Golden Age. 45 + 65 = 110 etc. For those who care to go thru the trouble and time, 110 can be found in sixteen different ways on this simple number square. The total of all 16 becomes 1,760. Those who know measurement can recognize 1,760 is another number of measurement: There are exactly 1,760 English yards in one mile. Three feet are in the yard. There are 5,280 feet in the mile. Thus, 5,280 ÷ 3 = 1,760. Why go through all this trouble? This number square once marked a lost Golden Age of Peace and Plenty. This code needs to be reactivated. Why shouldn’t we all have the same today? The tower at Glendalough Cathedral would then become the symbol of good things to come. Two Seven Two – What are these Three Numbers About? They provide a numerical key to lost prehistoric antiquity. Clues of the past have many forms and fashions. Numbers are one of them. A primarily defined number is megalithic yard. It was 2.72 feet. Professor Alexander Thom of Oxford University established this accepted measure. 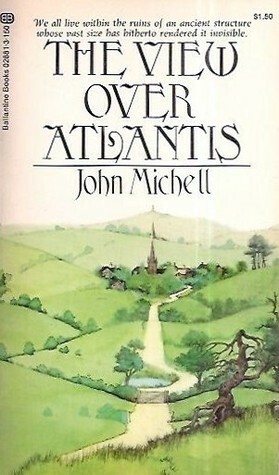 For background on the subject, study writings of the John Michell. His books have been my companions for over fifty years. Now they are mostly out of print and difficult to acquire. Megalithic Measurement in Malta comes from a simple number square. It is a straight read of numbers. A megalithic inch is 0.816 inches. That is a straight read across the bottom- left to right, on the 3 x 3 number square pictured to the right. If you reverse these numbers you have 618. These are the square root numbers of the Golden Section. This was called “phi” by the ancient Greeks- 1.618…. The square root is o.618 feet. Add the 8 perimeter numbers. You have 8 + 1 + 6 + 7 + 2 + 9 + 4 + 3 = 40. It is no co-incidence that there are 40 megalithic inches in the megalithic yard. In summary: Three primary ancient numbers come from the perimeter: (1) The megalithic inch as 816 comes from the bottom three perimeter numbers- left to right. (2) Phi’s square root numbers are from the same bottom perimeter but reversed as right to left (618). (3) The number of megalithic inches in the megalithic yard as 40 from the entire perimeter. This blog is the tip of the iceberg. Keep reading the posts on DSOworks for more information on the subject as well as on music. It will be forthcoming. Measurement Overview by the Traditional 3 x 3 Square. This simplest of number squares has an infinity of hidden number codes. I currently have some 535 posts on DSOworks.com. They are divided primarily between music and this simplest of of ancient number squares. Of course, music and measure overlap. With so many blogs, perspective is difficult. Who has the time to even quickly glance at so much material? The purpose of this blog is simply to provide a measurement overview of the source of measures. A few of the hidden codes are in this internal link. Overall rectangular part of Troy is 220 megalithic yards x 165 megalithic yards. It traces back to the 3 x 3 number square. With Troy, here is the computation. Follow the numbers on the square. 43 + 67 = 110. Backwards 34 + 76 = 110. Total is 220. This works with any opposite columns of two numbers. Megalithic yards were assigned to this number. It defines the length rectangular part of the citadel. Next, take two numbers at the time again as follows. Watch the number square with three pairs of numbers. 49 + 35 + 81 = 165. Take them in reverse: 94 + 53 + 18 = 165. It works the same way if you work the numbers horizontally. Both actual measurements of ancient sites and units of measurement came from the 3 x 3 number square. It was once the backbone of a civilization that was destroyed by a cataclysm. A Golden age of peace and plenty once marked this time. Perhaps it is time to return to a Golden Age guided by a simple number square? Golden Age refers to a mythological period of primeval human existence. It was perceived as an ideal state. Human beings were pure and free from suffering. Golden Age may also refer to: Golden age (metaphor), the classical term used as period of perceived greatness. In a Golden Age the weaker and stronger peacefully co-exist. Here a few of the measures mathematically derived from this number square. Review many of them on DSOworks.com. Type in the keyword. Egyptian cubit of 1.728 feet. Royal cubit of 1.72 feet. English furlong of 660 feet. English rod of 16.5 feet. Summerian inch of 0.66 inches. Summerian cubit of 1.65 feet. Masonic hundredweight of 112 pounds. Old gemancer’s mile of 14,400 feet. Jewish sacred cubit of 2.0736 feet. Jewish sacred pace of 3.456 feet. Chinese p’u of 14,400 feet. Akbar’s yard of 33 inches. Sacred Engineers Part One -Book Series on Line. I wrote a book. It is entitled “The Sacred Engineers Philosophy- The Pinnacle of Thought in the Unified Culture of Ancient Builders”. New knowledge is often kept at bay. It is not allowed to dock. The cargo of new knowledge that these ships carry are kept from unloading. Then a new era comes. Their cargo becomes suddenly desirable. Welcoming crowds even go out to greet the ships. Welcoming a desirable cargo shipment. Is there such a thing as new knowledge? Any valuable new knowledge is usually based on something old. Sometimes, the older, the better. This view was expressed in 1382 in a Biblical translation attributed to John Wycliffe’s followers: “No thing under the sun is new” (Ecclesiastes 1:9). Time is cyclic. Specifically: At one time there was a Golden Age. Strife among people nations was unknown. Food was plentiful. Such stories have been reduced to legends. Ancient Chinese referred to it as a time when yin ruled. This knowledge is alluded to in my link- the rose and lily. Oquaga Lake is where I realized the significance of number squares.I was the house piano player at Scott’s Oquaga lake House. Most of my poetry was writen while hiking around this area. The term Golden Age, as we know it, comes from Greek mythology. The Works and Days of Hesiod, describes the decline of the state of peoples through five Ages. Gold being the first and the one during which the Golden Race of humanity (Greek: χρύσεον γένος chrýseon génos)lived. Those living in the first Age were ruled by Kronos,. After the finish of the first age was the Silver. Then came the Bronze. After this, the Heroic age. The fifth and current age is called Iron. And what has been lost? Certainly the “Golden Age” factor. It denoted a period of primordial peace, harmony, stability, and prosperity. What can help to bring it about? Certainly, and most important, love. Also important,knowledge of number squares added balance to lost, prehistoric civilizations. Yes, the concept is mathematical in nature. The Sacred Engineers Part One was written to introduce and explain a series of posts that will follow. The book was written in dialogue form in the style of Plato’s Republic. Ancient Computing Utilized the Platonic Solids. First: What are the Platonic solids? In three-dimensional space, a Platonic solid is a regular, convex polyhedron. It is constructed by congruent (identical in shape and size) regular (all angles equal and all sides equal) polygonal faces. They have the same number of faces meeting at each vertex. Five solids meet those criteria. That’s it. A 6th cannot be constructed. The tetrahedron is the basis of the other four solids. Look at the 1st five numbers. With that knowledge, here is some mathematical fun. 1² x 2² x 3² x 4² x 5² = 14,400. Where is 14,400 significant as an ancient number? With 9 x 720° = 6,480°. (This is exactly 9 x the tetrahedron’with 720° degrees). (9 x 720 = 6480). Its second way is, 6 + 4 + 8 + 0 = 18. Reducing the number by horizontal adding of the smaller numbers, 1 + 8 = 9. With the remaining three solids: Cube has 2,160°. Each of its 6 squares has 360°. Thus, 6 x 360 = 2160. That is 3 times the 720° of the tetrahedron. Reduce 2160 and we have: 2 + 1 + 6 + 0 = 9. Finally, there’s the octahedron with 8 triangles. 8 x 180° = 1440. That is 2 x the 720° of the tetrahedron. Then 1 + 4 + 4 + 0 = 9. Why was number 9 the limiting number of the Platonic solids in the manner described above? I like to call the nine-boxed digits in the number square below the “stamping mill of the Universe.” Nine is the highest number of the traditional arrangement of the pictured numbers. A second mystery: Why are there only 5 possible regular polyhedrons? Because 5 is the core number of the 3 x 3 number square. The infinitely complex Universe is stamped out from this simplest of number squares. A third mystery to solve:: Why was a megalithic mile 14,400 feet? How did it relate to King Arthur’s Palace? The answer is simple. Total the number of degrees in the 5 solids. They are listed above. We have, 720 + 1440 + 2160 + 3600 + 6480 = 14,400. Now read the internal link below. Mesolithic cultures worked with the 3 x 3 number square for ancient computing. Roses hold a primary ancient secret. Again, read this internal link. The high priests of various cultures and countries knew its secrets. Another known entity was how this tiny number square can become infinite. Link is also below. I’m attempting to restore this lost knowledge. My insights all took place on Oquaga Lake. I was the house piano player at Scott’s Oquaga Lake House for years. I communed with a female Indian spirit from the Lennie Lenape. This numerical square could offer a common vision based on balance. That, in turn, could initiate another Golden Age. Beautiful Oquaga Lake, former stomping ground of the Lennie Lenape Indians. Another Ancient Dodecahedron in Summeria. Check the last blog. This same model applied to ancient Israel. The blog explains the parallel. This same figure explains our current musical circle of fifths. The dodecahedron is quite inclusive. Ancients ascribed the overall shape of the Universe to this figure. Click on my internal link below: Translating Geometry to Words and Numbers. This link contains another internal link. Both also define the dodecahedron in antiquity. This shape was once thought to encapsulate the Universe. Modern usage for dodecahedron in a playground. Male deities: Ishkur/Adud was 10…. Utu/Shamash was 20… Nanna/Sin was 30…Ea/Enki was 4o…Enlil was 50…Anu was 60. Female deities: Ninnhursag was 5…Iaanna/Ishtar was 15. ..Ningal was 25… Niaki was 35…Ninlil was 45…Antu was 55. With our featured picture we have five numbers and a corresponding Summerian god pinned to each of the 12 pentagons. In effect the numbers define the 5 vertices of each of the 12 pentagons. Look at how varied the dates of its various uses are. The 12 primary key signatures of the circle of fifths became prevalent in the 18th century. It is still widely used. The dodecahedron’s parallel to the 12 tribes of Israel was officially established in Israel about 1,000 B.C. The 12 Summerian gods came about 4,000 B.C. Ancient civilizations associated the simplest number square (3 X 3) with Saturn. This number square has hidden codes not seen by most. That is my reference in the featured picture. It can be look at by 3 numbers at the time or by hundreds. It literally is the stamping mill of the Universe. Many blogs on this website are about this number square. Read my internal link below. Why all this fuss? Understanding this lost knowledge and its redeployment can initiate a new Golden Age. Such an age is marked by peace and plenty. Characteristic Number Hides a Secret Code. Civilization has lost its touch with the past. A lost Golden Age was all about number squares. Two opposite numbers always totaled the same number. Our featured number square will be the 3 x 3. Its characteristic number is 10. Any two opposite numbers total 10. These include 9 + 1; 4 + 6; 3 + 7; and 2 + 8. First, where did I first learn about number squares? From the writings of British author, John Michell. Many of my blog are about the 3 x 3 number square. Below is an internal link to one of them. I However, I was able to take John Michell’s work a step further. This is because of an American Indian spirit guide from the Lennie Lenape. It all happened on Oquaga Lake (See picture below). This book started me on a thus far 50 year journey. The 3 x 3 is 10. The 4 x 4 equals 17. The 6 x 6 is 37. The 7 x 7 is 50. The 9 x 9 is 82. So where is the hidden number code? Take the prime characteristic number of the 3 x 3 number square. Its sum is 10 as described. Next, total the numbers from 1 to 10. They equal 55. You have just seen how the center of the 3 x 3 number square becomes 55 when viewed two numbers at the time. Today many scoff at this. The ancients of a lost Golden Age accepted it. My Indian spirit guide also offered a book of poetry, filled with her wisdom. Harmony uses basic number ratios. The consonant harmonies were either 1:1, 1:2, 2:3 and 3:4 or sometimes 4:5. Higher number ratios were considered to be anywhere from mildly dissonance to dissonant. Around the horseshoe are the remains of the outer sarsen circle, capped with lintels. There were probably once 30 stones in this circle. Set just inside the bank were 56 pits, known as the Aubrey Holes. About half of these have been excavated. They were marked in the 1920s with white concrete circles. 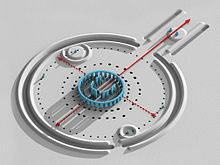 The inner enclosure forms a horseshoe shape of five trilithons. Now to the 5 x 5 number square. The 5 trlithons also refer to the 5 x 5 number square. The numbers 1 to 25 total 325. Multiply the factors of this number as 3 x 2 x 5 = 30. That totals the Sarsen Circle stones. Stonehenge Number Squares: Numbers defined relationships among many disciples. Ancients said, as with the large, so is the small. It is well established that the Stonehenge could predict the occurrence of ellipses. That is the large. The small is defining an atom of Iron. This element is defined by 26 protons and 30 neutrons. The atomic weight is 56. Iron is the significant element of nuclear fusion. Click on the internal link below. Hoyle proved that this could have been used to produce a much more reliable method of predicting eclipses as whenever the moon and sun markers are directly opposite each other and the other two stones occupy those same opposing points, an eclipse can be guaranteed. In unity there is peace. I believe, for this purpose, it is about time to understand this ancient and forgotten use of number squares. This can create a happy fusion of the assorted elements of mankind. Saturn with 3 x 3. Jupiter was 4 x 4. Mars was 5 x 5. The Sun was 6 x 6. Venus was 7 x 7. Mercury was 8 x 8. The Moon was 9 x 9. The most complex was the simplest.The rings of Saturn are the most extensive planetary ring system of any planet in the Solar System. They consist of countless small particles, ranging from μm to m in size, that orbit about Saturn. The full set of rings, imaged as Saturn eclipsed the Sun from the vantage of the Cassini orbiter, 1.2 Million km distant, on 19 July 2013 (brightness is exaggerated). Earth appears as a dot at 4 o’clock, between the G and E rings. Galileo first observed the rings in 161o. Likewise, a number of mathematical rings surround the 3 x 3 number square. Add the numbers around the central 5 (I term these numbers p1 which stands for perimeter one). 4 + 9 + 2 + 7 + 6 + 1 + 8 + 3 = 40. Then add them two at the time overlapping the numbers. (I call this p-2. This stands for perimeter two: 49 + 92 + 27 + 76 + 61 + 18 + 83 + 34 = 440. Now take the numbers three at the time. Overlap the third with the first number. I call this p-3. This stands for perimeter three. 492 + 276 + 618 + 834 = 2,220. These numerical rings around the 3 x 3 number square were used to measure holy sites of ancient civilizations. The ways have been described in the blogs on DSOworks. The blogs are free and easy to access. We are about to enter a new era of peace and plenty. It is also termed a Golden Age. The codes contained in this planetary number square can help in this quest.